If you enjoy an afternoon at the mall as much as an evening spinning slots, Slotland has just the game for you! They've just introduced their decadent new Reel De Luxe shopping-themed slot game. The new game, with designer bags and shoes, perfume, and jewellery spinning on its reels, has three exciting bonus features to increase winnings. To celebrate the launch of The Reel De Luxe, a $12 freebie is available until May 16th. If you're a VIP player you can claim a $22 freebie! There's also a choice of deposit bonuses on offer this week. • Three Bonus symbols trigger a bonus round where you select symbols to reveal prizes. • Shoppers love a sale and in this game when three Sale symbols appear, you get 10% to 100% discounts on your next three spins. • When three or more Present symbols appear, click one of them to reveal an instant prize. Five Necklace symbols with a minimum $5 bet wins the casino’s site-wide progressive jackpot which is currently nearly $300,000. Until May 16, 2017, a freebie and a choice of casino bonuses with various wagering requirements are available for you to try the new game. All players that have made at least one prior deposit are eligible. 21X wagering requirement, 10X max. cash-out. Valid for Reel De Luxe only. 17X wagering requirement; valid for Reel De Luxe only. 10X wagering requirement; may be claimed up to twice per day; valid for all slots and progressive jackpot games. 10X wagering requirement; may be used up to twice per day; valid for all games. These bonuses are valid May 10-16, 2017 only. Famous for its friendly customer service, Slotland has been providing unique real money online slots to players all over the world for more than 18 years. 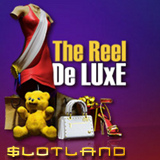 The Reel De Luxe is available exclusively at Slotland and its partner, WinADay Casino.